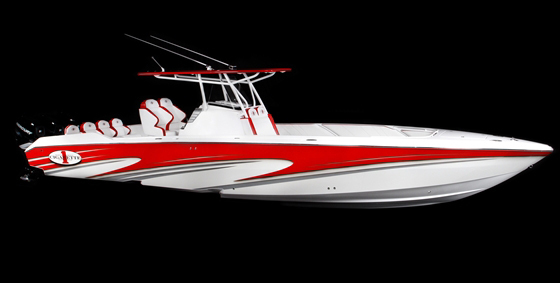 The Cigarette 46' Rough Rider is everything a prime-time offshore V-bottom should be. Talk about a show stopper. There we were at our test site in Placida, Fla., tending to interior inspections, photography and the endless dockside details of our annual Performance Trials, when the Cig-arette 46' Rough Rider rumbled up the channel and headed our way. Even the most seasoned Test Team veterans stood there gaping at the 46'-long, 8'-wide stepped V-bottom as it idled to the docks. The 46' Rough Rider, like many of the models Cigarette builds, had that kind of commanding presence. It stood tall in the water. It had muscular lines. It looked almost defiant. As well it should have for the as-tested price of $725,000 with twin 925-hp motors from Zul Racing Engines, Mercury Racing dry-sump No. 6 drives and Hering five-blade propellers. The 46' Rough Rider rode on a three-step, 24-degree bottom. Located approximately 15 and 12 feet from the transom, the first two steps were taller than the final step, which was 7 feet from the stern. The boat's two outer strakes ran full length, and its inner pair stopped at the end of the forward-most running surface. Chines were 4 1/2 inches wide and flat. To use the force from the 686-cubic-inch blown engines, the builder went with the aforementioned No. 6 drives with 1.5:1 reductions and Hering 16 5/8" x 34" five-blade stainless-steel propellers. 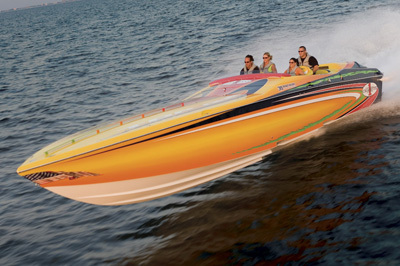 The manufacturer estimated that the 46' Rough Rider would run 115 mph in the right conditions. We didn't have the right conditions—the water was mostly flat and, like the air, extremely sticky—but we did get the boat to hit 111.2 mph at 5,800 rpm. That's moving in a 10,900-pound V-bottom, steps or no steps. 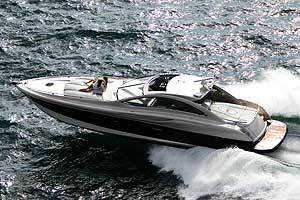 Even more impressive was the boat's ability to cruise at 100 mph without straining. The 46' Rough Rider didn't so much accelerate from a standing start as it did erupt. Time to plane with the 30S Mercury K-planes down was 3.9 seconds—approaching the realm of tournament ski-boat planing times. 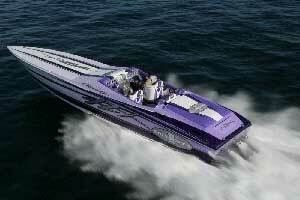 In 20 seconds, the boat hummed along at 86 mph. The boat was equally volcanic in midrange acceleration tests. It shot from 30 to 50 mph in 4 seconds, 40 to 60 mph in 4.5 seconds and 40 to 70 mph in 6.4 seconds. 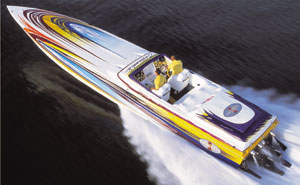 While not quite a tournament ski boat in slalom turns at low speeds, the 46' Rough Rider was nimble for its length. It handled better with speed, especially in sweeping high-speed arcs, and tracked laser-straight at all speeds. 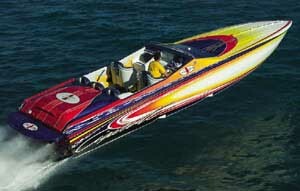 Unfortunately, the 2- to 4-footers in the Gulf of Mexico on test day were not much of a challenge for the big Cig-arette. In those puny conditions, the 46' Rough Rider was anything but challenged. Our lead test driver and co-pilot blasted along seated at 90-plus-mph offshore, never needing to drop the bottoms out of their bolsters and stand. The 46' Rough Rider felt like fast-moving granite in the tame offshore conditions we found. We have every reason to believe, however, it would feel the same in big water. The handlaid, vacuum-bagged boat was constructed with vinylester resin and multidirectional fiberglass, Decolite bulkheads and foam-filled stringers in the engine compartment. In the bottom, the builder used 3/4-inch coring; 1/2-inch coring was used in the hull sides. Mold work on the high-sided boat was flawless. It made a great canvas for the perfect paint application, which was protected by a meaty rubrail. The motors were installed in a staggered configuration, with the forward-most engine to port. 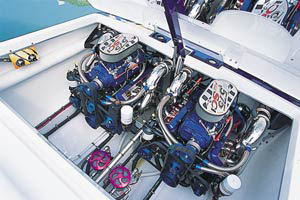 Each motor was mounted on offshore racing mounts with L-angles through-bolted to the stringers. Drive line covers were color-matched to the boat's exterior, as were the covers for the flame arrestors and the battery boxes. To secure the engine compartment wiring and cables in parallel runs, the manufacturer used stainless-steel and aluminum cushion clamps. The engine compartment itself was voluminous—easily large enough for triples—and as such would be a dream to work on. To make cleanup even easier, the builder finished the bilge in epoxy. Cigarette is a custom builder, which means buyers can dress up the cabins of their 46' Rough Riders just about any way they see fit. The buyer of our test boat kept things clean and simple in the cabin—the right choice for a serious offshore boat in our book—and stayed away from breakables such as fancy electronics. Still, the cabin was comfortable and boasted a power door, a V-berth large enough for two people, long facing lounges, a head unit and several stowage lockers. In the cockpit, the bolsters were installed on color-matched through-bolted aluminum frames. So plush were the bolsters that it was mildly surprising their drop-out bottoms were manual. Then again, manual dropout bottoms aren't subject to motor or actuator failures. The co-pilot's station also was equipped with a locking glove box, a cooler and color-matched grab handles. At the helm station, the Garmin GPS unit was augmented by a Gaffrig 120-mph GPS speedo, a host of engine-monitoring instruments and mechanical drive- and tab-trim indicators. Rubber-booted toggle switches for the accessories were arranged neatly in rows. Marine Machine shifters were on the left side of the dash. Throttles were to the right. 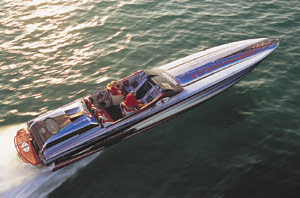 Cigarette's 46' Rough Rider did everything a true offshore boat should at speeds most will never see. It was an impeccably built showcase—a head-turner of epic proportions. Propellers Hering 16 5/8" x 34"
Mercury Racing HP575 SCi engines, hydraulic engine hatch, full-hydraulic steering, hydraulic cabin door, Gaffrig gauges and bezels, Marine Machine shifters and throttles, depthfinder, Garmin GPS and GPS speedometer, stereo, canvas covers, full carpeting and Pirelli flooring. Upgrade to 925-hp Zul Racing Engines ($NA) and Lip-Ship Package ($40,000). Test conducted at Placida, Fla.